Convert MP4, FLV, WebM, MP3, and any other format video/audio files to any format for any device. MP4 Converter is a Windows application to convert MP4, FLV and WebM videos to any format for any device. It converts videos to MP4, H.264, FLV, WebM, WMV, AVI, MPG, 3GP, MP3 and more various formats, it also converts videos for any device: iPhone, iPad, iPod, BlackBerry, PSP, cell phone or any other mobile device. 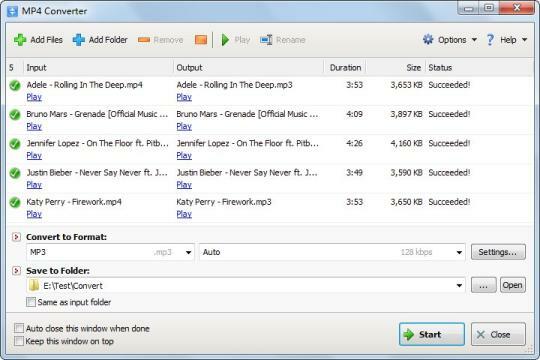 You can also extract sound tracks from your video files, and save them as MP3, AAC, AC3 or any other popular audio format. MP4 Converter is powerful but easy to use, just drag and drop video files to the program, select the output format, then click "Convert" button to start converting! Convert video files to MP4 format compatible with popular multimedia devices. 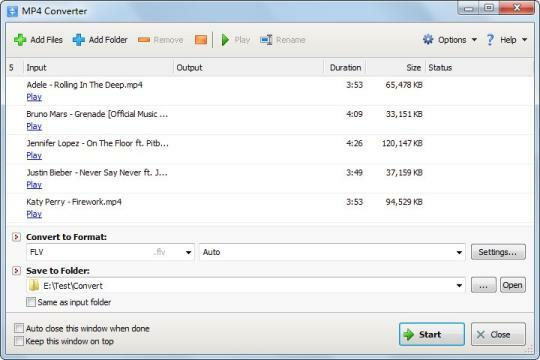 Convert MTS, M2TS, and TS files to popular video formats. Convert your video files or DVDs to Flash format and embed them to a Web page.